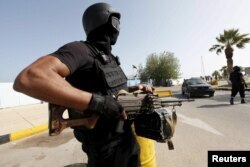 Will Arming Libya’s ‘Unity’ Government Escalate Conflict? FILE - Fighters from Misrata fire weapons at Islamic State militants near the coastal city of Sirte, Libya, March 15, 2015. The focus was how to combat Islamic State militants and halt their unnerving advance in Libya, just a short boat ride from southern Europe. But Western powers’ announcement Monday of their readiness to arm the struggling unity government in Tripoli has gone down badly with a rival government and its militia in the east of the fractious, chaotic country. Supporters of General Khalifa Haftar – the muscle behind the opposition National Salvation Government – are scorning the Western powers’ decision to support a partial arms ban exemption for the United Nations-negotiated Government of National Accord (GNA). U.S. Secretary of State John Kerry had encouraged aiding the GNA, led by Prime Minister Fayez al-Serraj, following a meeting Monday in Vienna with diplomats from 20 other Western countries. "The international community should support the Serraj government, which is the only legitimate one in Libya, and which must now start to work," said Kerry, who presided over the meeting with his Italian counterpart, Paolo Gentiloni. 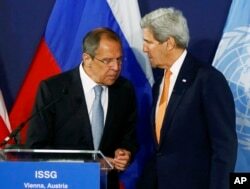 Russian Foreign Minister Sergei Lavrov, left, speaks to U.S. Secretary of State John Kerry prior to their news conference in Vienna, Austria, May 17, 2016. The United Nations had imposed an arms embargo in 2011 to stop strongman Moammar Gadhafi from securing weapons to quell the uprising against him. He was killed in October of that year. Kerry argued that acceding to a GNA request for arms and training is imperative to help restore order to the country. The GNA is in Tripoli; the rival government is in Tobruk. A member of the force assigned to protect Libya's unity government stands at the entrance to where the government has their offices, in Tripoli, Libya, April 14, 2016. In a series of angry tweets, Haftar supporters condemned the West's readiness to lift the arms embargo and aid the GNA. The Al Hurra TV channel, on its Twitter account, called the move "foreign meddling in [Libya’s] sovereign affairs." Supporters, though, see nothing wrong with Egypt's or the United Arab Emirates' arming Haftar and his so-called Libyan National Army, made up of former militiamen and veterans from Gadhafi’s security forces. Analysts say Vienna may have set the stage for a race between Libya’s regional rivals to capture Sirte, the coastal city that several thousand jihadists have controlled for almost a year. Just days before the Vienna meeting, militiamen from the town of Misrata, which back the GNA, and Haftar’s fighters skirmished south of Sirte. Now there’s an added incentive for Haftar’s forces to get to Sirte before arms start flowing to the GNA militia allies, some analysts warn. Jason Pack of the consultancy Libya-Analysis said he feared loosening the arms embargo “could fuel tensions rather than deter them,” adding that “an injection of weapons to the GNA is likely to amplify factional rivalries” rather than help tamp them down. “The international community’s undeterred championing of the GNA seems increasingly out of step with Libyans’ sentiments,” Pack said, noting growing public support for Haftar. The Gadhafi-era general and his forces have made gains in recent weeks against IS and other militants in Benghazi, Derna and Ajdabiya. Stabilizing Libya is an urgent goal for the West as it tries to combat IS more effectively and counter the smuggling of migrants to Europe. The unity government, installed in March, was meant to be a first step in bringing order to a country that has known little since Gadhafi’s ouster. Western officials have placed hope in war fatigue, the allure of foreign aid and development money, and the growing threat of IS to build popular momentum for the unity government. But in large parts of Libya, questions remain about the GNA’s legitimacy. Under the U.N. negotiated deal, the GNA is meant to be sharing power with two rivals: the east’s National Salvation Government, an arm of the House of Representatives (HoR); and the rump of the General National Congress, which refused to stand aside after Libyans voted for the HoR to replace it as the country’s legislature in 2014. But the GNA has struggled to consolidate its position in the Libyan capital, let alone expand its authority to the rest of the country. It remains dependent on the support of powerful western militias, whose loyalty remains suspect and who may be biding their time to see how the unity government fares. The HoR has failed to endorse the GNA, a move required under the U.N. deal. HoR President Ageela Saleh warned Monday his legislature won’t approve the unity government unless ministers selected by al-Serraj attend a session in Tobruk, which they refuse to do, citing security concerns. Hafed Al-Ghwell, a senior adviser with Oxford Analytica, a global risk advisory group, said big questions remain about the GNA’s credibility. “Many people have been excluded, especially tribal and former Gadhafi officers as well as over a million Libyan exiles in Egypt and Tunisia,” he said. He warned that by giving arms to the Tripoli-based GNA government, the West would essentially be taking sides in what in effect is a civil war. Migrants who'd attempted to flee to Europe wait in Libyan coast guard detention in the coastal city of Tripoli, Libya, May 16, 2016. The country's civil war has created openings for extremists, which Western governments hope to halt.